A Texas woman was arrested and charged with retail theft after Cedar Park officers found her Wednesday next to a Shell gas station drinking a $3.99 bottle of Mad Dog 20/20 she had just stolen from the station, the warrant said. Mad Dog 20/20 is a slang word for a cheap wine made by Mogen David. Walicke has two previous convictions for theft, the warrant said. Alicia Walicke, 22,told police she stole a bottle of cheap wine from a gas station so she could get arrested and see her boyfriend in the Williamson County Jail, according to a warrant. “Walicke advised her boyfriend was arrested earlier that evening by Cedar Park Officers and it was her fault so she wanted to make things right and go to jail,” according to the warrant. 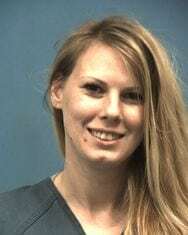 She was previously charged with assault against a public servant in March when she bit a police officer’s arm while officers were trying to restrain her after she became combative when they responded to a call about her making suicidal threats, a warrant said. Police believed she was under the influence of an unknown drug and were trying to get her medically evaluated, the warrant said. Walicke was released from the Williamson County Jail Friday after posting bond on bail set at $5,000, according to court records.